The New Astronomy Guide is a one-stop introduction to how to practise astronomy in the digital age. It explains the principles of astronomy as well as the practical techniques to provide both beginners and more experienced observers with all the information they need to understand and enjoy the wonders of the night sky - and to capture and share the resulting images. Beginning with what can be seen with the naked eye in both the day and nighttime skies, Patrick Moore and Pete Lawrence describe the origin and nature of the Sun, Moon, planets, stars, and distant galaxies - and a host of other extraordinary astronomical objects - and how you can capture their images using a camera (or even a camera phone!). For those whose interest develops further, advice is given on choosing and using a telescope, teaming it with a camera, and capturing the sort of images which until recently could only be obtained with professional instruments. A full star atlas then helps you track down what you can see on any night of the year, making this a complete and self-contained guide book. The late Sir Patrick Moore was the presenter of the world's longest-running television programme - the BBC's 'The Sky at Night', which was first broadcast in 1957. A Fellow of the Royal Society, he authored more than 100 books, and played a unique role in astronomy education and popularizing science through six decades. 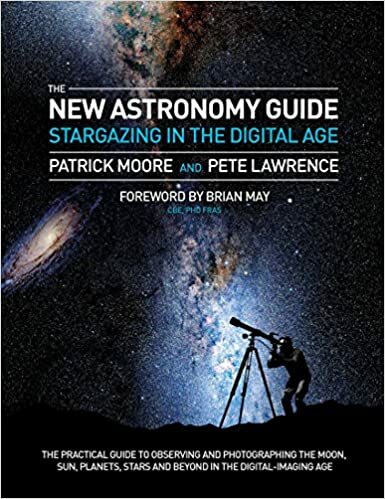 Pete Lawrence appears regularly in 'The Sky at Night' demonstrating practical astronomy with an emphasis on what can be seen in the night sky that month. He is an expert observer and photographer, and is renowned for his spectacular astronomical images, several of which have featured on the NASA-website - Astronomy Picture of the Day.